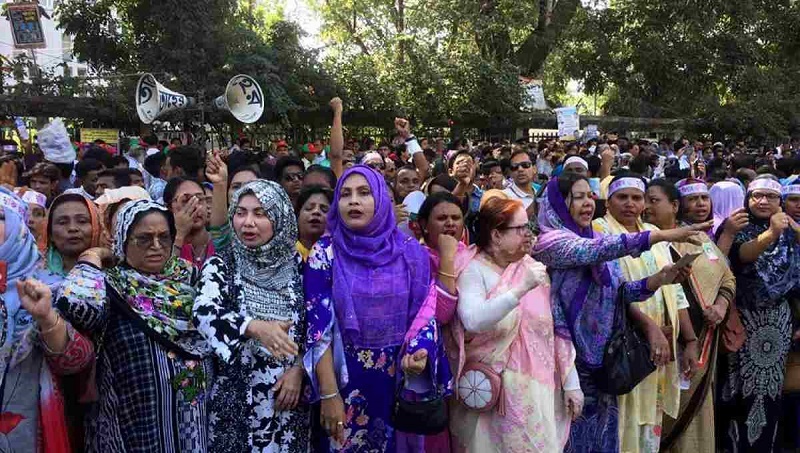 As part of its countrywide scheduled programme, BNP leaders and activists formed a human chain in the city on Wednesday protesting the conviction of its chairperson Khaleda Zia in Zia Charitable Trust graft case, UNB reports. Several hundred BNP leaders and followers formed the human chain around 11:00 am in front of Jatiya Press Club amid tight security. They chanted different slogans demanding the release of their leader Khaleda Zia immediately. BNP senior leaders including its secretary general Mirza Fakhrul Islam Alamgir addressed the programme. All metropolitan city and district units of the party are also scheduled to observe the programmes at their convenient time and places. BNP senior joint secretary general Ruhul Kabir Rizvi on Monday announced a three-day countrywide programme including the human chain protesting the conviction of its chairperson Khaleda Zia in the Zia Charitable Trust graft case. As part of the programmes, the party will also observe a token mass-hunger strike on Thursday in all metropolitan cities and district towns. On Monday, a Dhaka court sentenced BNP chairperson Khaleda Zia and three others to seven years' rigorous imprisonment each in the much-talked-about Zia Charitable Trust corruption case.